Turns out I know someone who owns an axolotl! Thanks for the picture, Raph! Oh so cute! 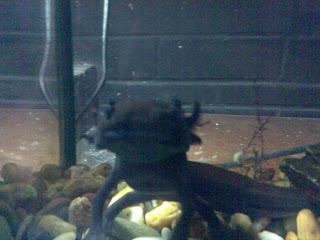 Axolotl...sorta like choclatl in 'The Golden compass'. COOL! I don't have any pets. I want one though. what is it? a fish type thing? Hobbes: Scroll down, my friend. BTW, Raph, I'm thinking of getting one of these for myself! Kurosignal: I know kawaii--what does kuh ai mean? oh, I just googled it and they look awesome!!! are they like goldfish and be boring all day or do they do stuff? Kirsten: That would be awesome. I only know one other person with an axolotl, and he's 5.
sffh: About 25 centimetres at full length. Hobbes: They're usually quite calm, but they swim around a lot. The get agitated or excited when you put a net/finger in or they smell food.